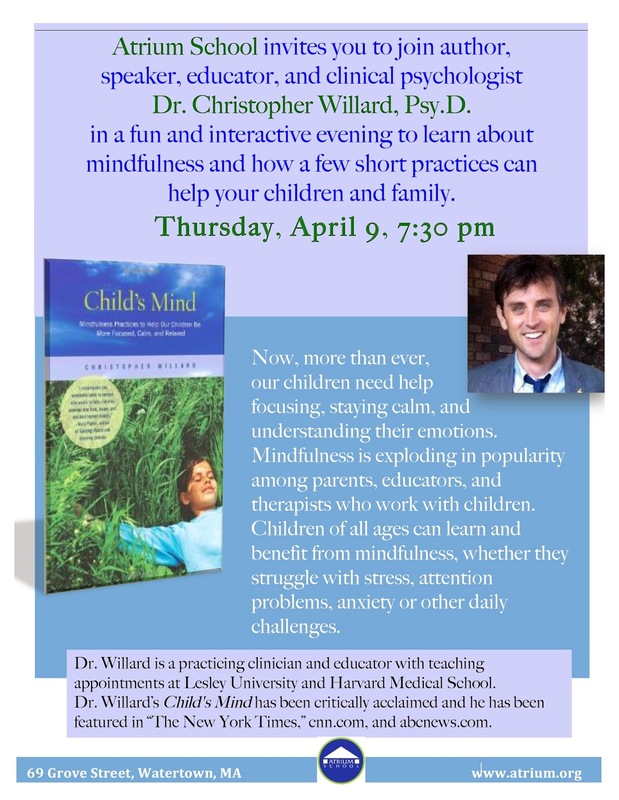 Dr. Christopher Willard, a psychologist specializing in mindfulness techniques for children and adolescents, will be speaking at Atrium School in Watertown at 7:30pm on Thursday, April 9th. Dr. Willard is a practicing clinician and educator, with teaching appointments at Lesley University and Harvard Medical School. Has been featured in The New York Times, and on cnn.com and abcnews.com. He authored Child's Mind (Parallax Press, 2010) which was critically acclaimed by Thich Nhat Hanh, Susan Kaiser Greenland, Mary Pipher and others. He also wrote the Mindfulness for Teen Anxiety Workbook (New Harbinger Press, 2014). Atrium School parents invite you to join them for an entertaining and interactive evening in which you can learn about a few short practices to help children of all ages understand their emotions, stay calm, and better deal with stress and daily challenges.